Stockmanship School-Instructor Steve Cote-teaching a young man to start bulls going a desired direction by going back and forth in straight lines perpendicular to that direction. These bulls would run across the pen a half hour ago, now they are under the control of a boy and becoming calm and responsive. These were difficult to handle stock an hour ago now they load readily, even without dogs, horse or fences to help. Its not hard if you get them handling well first. The Stockmanship Method we teach is probably more powerful than the advent of modern veterinary medicine. You can drastically reduce your sickness rate-just by handling your livestock better. Traditional handling stresses animals so they are more susceptible to sickness. If you want to control respiratory and other diseases, the most powerful tool is good handling, not vaccines. About 27 years ago Bud Williams stockmanship was coined low stress livestock handling by Allan Nation of the Stockman Grass Farmer. 2)stop forcing, only let cattle do what you want. Bud was looking for a way to reduce the stress in handling and discovered the high control that also results. He also said you must get your animals working for you before you do things with them. Today however, as a result of some people teaching "low stress livestock handling" that is not the best, its important to define what is the best method for the cattle and producers so that you can study the right stuff. Firstly, a method has to come directly from the animals, it has to "fit" them or accommodate the traits of the animals, which Bud Williams teachings do at a high level. It cannot have elements that cater to how we want to handle them to save time, thought or effort, it must be wholly how stock need to be handled in order to have stock want to do what we want. 1)Setting it up, or arranging our movement and actions so that cattle will want to do what we want calmly, then getting out of their way of doing it (which is allowing them to get the paycheck for doing it-which is release of pressure and not inadvertently inviting the wrong thing). We are letting them get away but controlling their way of doing it-which is basically how you train a horse. Also don't invite the opportunity for them to take the wrong way or they will take it most times. 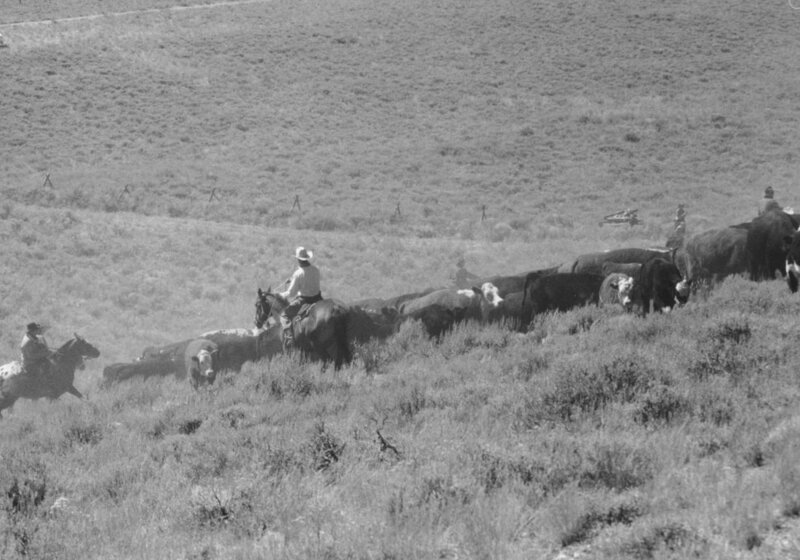 Here is an example, I was riding with an agency fellow on the range, helping a grazing association move some cattle from one unit across a cattle guard and down a road with a creek on the left side. I had about 500 easy to handle pairs but he said that the stock always would fall into the low lying areas that had lots of beaver dams and soft soils. I said we won't let that happen this year so here is what you do-before I bring them around the cattle guard you put yourself on the opposite side (uphill) of the creek, above the road and just keep some movement on you or the horse or both and they will go straight down the road, not to the creek. I came around with 500 pairs but he wasn't on the uphill side, he was down near the creek trying to form a fence with the horse, so he was moving and so the cattle were falling into the bottoms as they went by him-because cattle want to see what is pressuring them-so they curved around and into the bottoms. 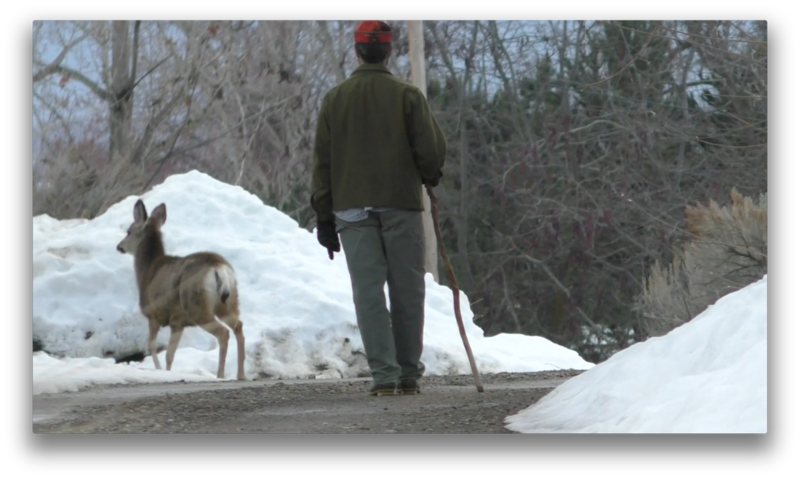 I stopped them before too many more got past and we started again, this time with me above and him bringing them. I pressured just a bit back and forth and they watched me and 500 pairs went down the road nicely. Cattle can't be paying attention to me on the right and turn left because they want to see what is pressuring them. The moral of the story is don't stop cattle from doing what they aren't doing, let them do it-don't invite "mistakes". 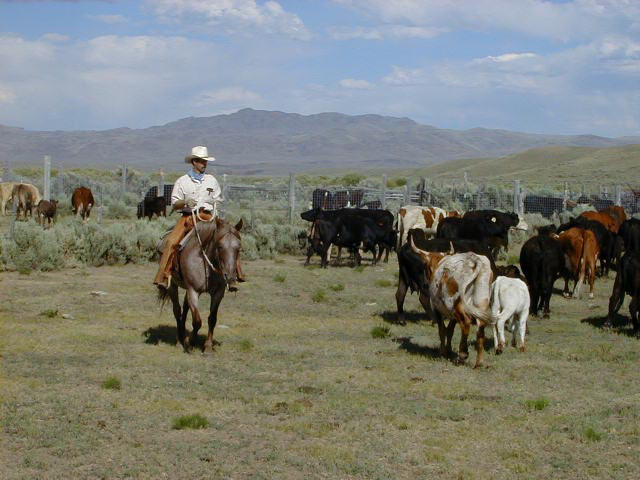 Stockmanship is comprised of a set of principles (like with horses), techniques, understanding of cattle traits and some guidelines, tips and things not to do. 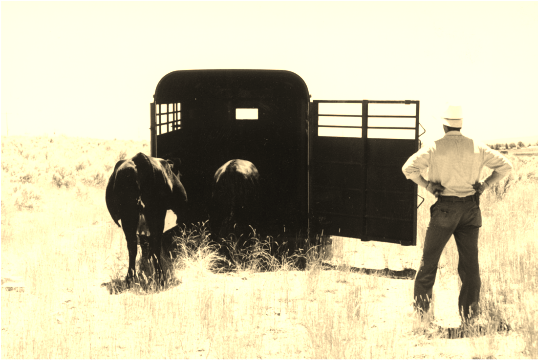 If you follow the horsemanship principles, you can solve cattle handling issues. Use all these components consistently and you will create calm, responsive, healthy and productive animals. Most herds need to be worked to have trust built, as traditional handling creates distrust or fear, then the techniques work consistently if you apply them in accord with the principles etc. Most people don’t realize its all in with cattle, all the time, if you want the best results, its vital. If you train and ride a horse properly, so its light and supple, then loan in to someone who rides like a sack of spuds and jerks on him, it won't take too many minutes before he gets stiffer and less responsive. You don't need great skill but do it but you need the will to do this consistently. This manner of handling produces calm, responsive stock that will load into trailers willingly, stay where you place them, drive well, be calm about weaning, will stay together, go past people calmly, through gates, turn easily, go up the chute calmly etc. Stock handled in this manner respond calmly to everything the handler does. Stock aren’t aggressive towards people, are good mothers, free of stress induced sickness (like BRD) and footroot, are relatively unconcerned about noises, thunder, traffic and other pressures. When stock learn to take our pressure, they can take many other pressures well, they aren't stressors anymore. It works on bison, antelope, deer, sheep, goats, range horses, dairy, beef and other cattle. You can turn the lead cow a long ways away by pressuring their hip. Very handy to be able to do when driving stock down a lane and you want them to turn down one path or another. 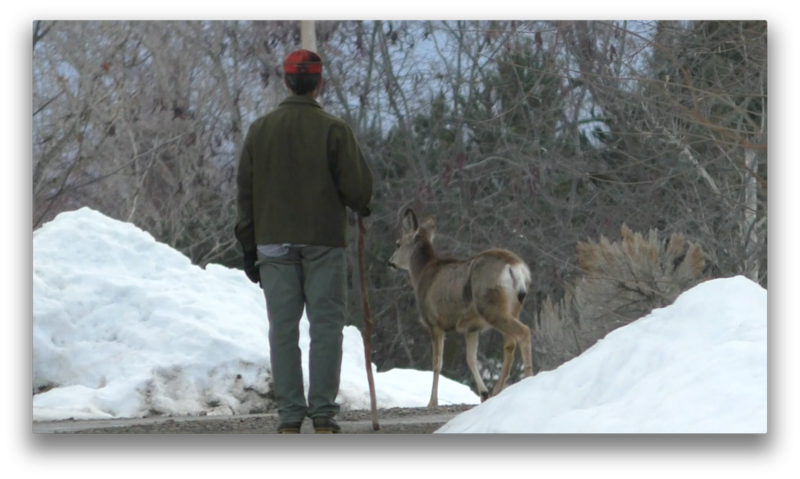 This deer turned left even though its buddies were down and to the right-mule deer want to see whats pressuring them just like cattle. 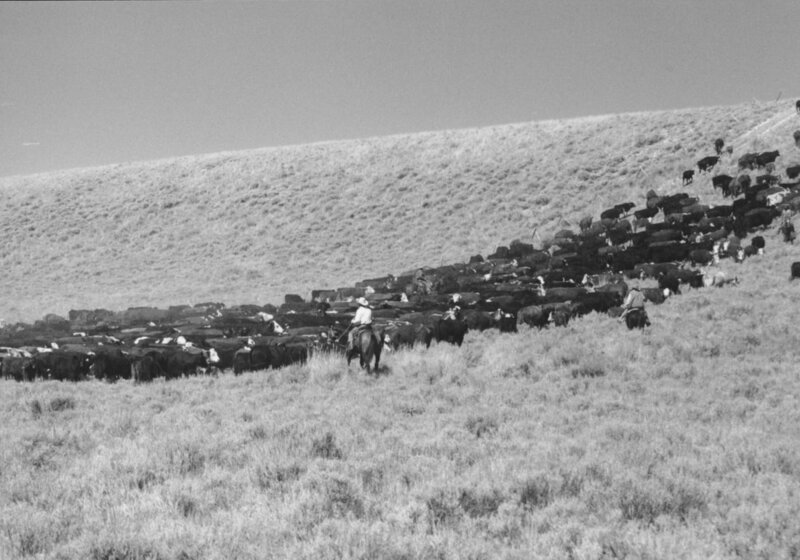 One of the most powerful tools for grazing lands management is when cattle stay as a herd (where you find one you find them all) and that a herd will stay where you place them. So, a herd will stay in uplands, leave to drink then return. Herds can be moved on when desired, so that overgrazing and over resting can be controlled, enhancing uplands and riparian areas. If the herd is under control of the riders then you can go around sage grouse leks or nesting areas, and other critical spots like poison patches, elk calving places or campgrounds etc. These figures are coming from ranchers and association riders. 1) The association develops and follows a good grazing plan (controlling time plants and soils are exposed to livestock). 6)Reduced losses from fires and livestock killed by smoke because stock location is known and where you find one you find them all-highly variable losses. Also, reduced or zero losses on high snow years like last year and bunch quitters starved-highly variable but does occur. 10) Reduced dust pneumonia, average doctoring 50 per year, savings about as above but probably much more. Average savings are very conservative and summed up for just the items I could quantify and that are common to many associations –the savings are at least $197,000 per year but assume some items are too high so lets use $177,000. Ranches and associations would realize different savings on different items and amounts would vary, sometimes highly. If 2 contract riders cost about $29,000 per grazing season, that is a benefit to cost ratio of better than 6:1. 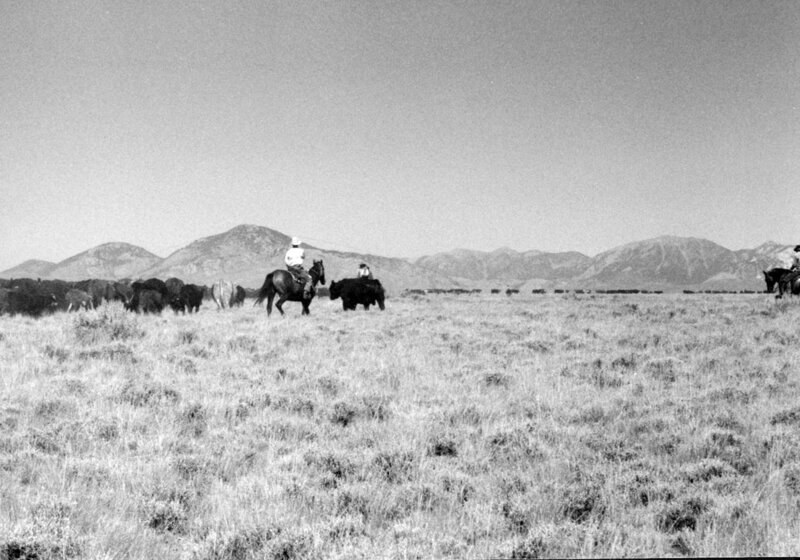 Ride straight by and cattle will move ahead straight. Using the right techniques helps animals do what you want. ..which here I am riding down the sides, which is a very effective way of getting stock up steep hills, riders in the back can now pressure cattle more effectively because the lead is moving up, before they would just shove the cattle in the rear into the cattle ahead so they would sidehill or break back. Some moves up steeper hills now take 45 minutes instead of 4 hours and the stock aren't stressed, just a little tired. Now we are over the top of the hill and 1,300 pairs and yearlings are trailing nicely to the next grazing unit. Three or four riders did in a quarter of the time what used to take 14 because the cattle were well handled first and riders then set it up so they wanted to go where we wanted.